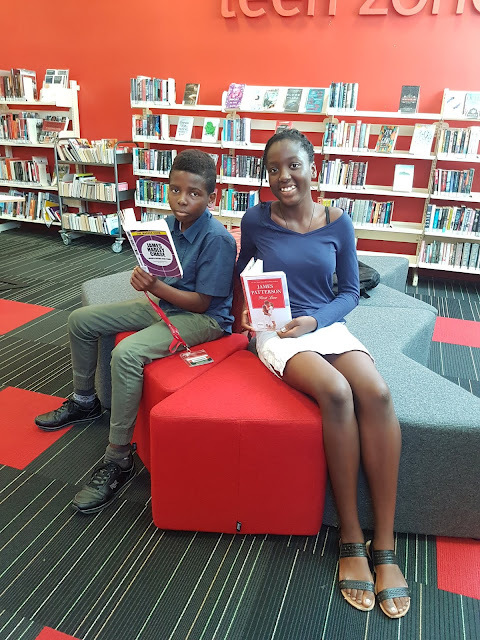 From a book-loving family, Joshlyn and Wisdom were already keen readers when they came to New Zealand from Nigeria a year and a half ago with their mother and father, a PhD student at the University of Auckland. “Everyone in the family reads, Mum, Dad, Grandma, Grandpa,” Joshlyn told us. She and Wisdom were both reading by age three – books in English, the language of most books available in Nigeria, though the family speak the Bini language at home. Wisdom and Joshlyn with Mt Roskill librarians. 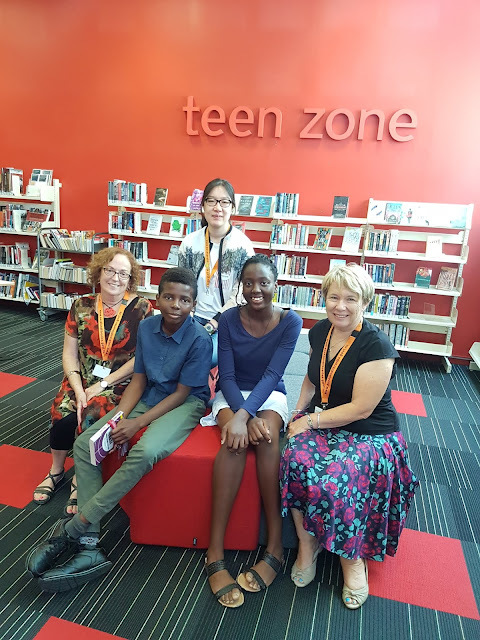 They were library users in Nigeria, although Joshlyn says “I always begged my Mum to buy books whenever she went out because the city library was really old and the books were old also”. When they moved to Auckland and visited their local library in Mt Roskill, Joshlyn recalls, “It was bigger than ours and had lots of books. I was in heaven”. Joshlyn’s favourite writer is James Patterson, and she has already started in on his books for adult-level readers. Her Great Summer Read fare also included Jacqueline Wilson titles, Little women for the 'Read a classic' challenge, and Every day is for the thief by the American-Nigerian writer Teju Cole, but mysteries have always been tops for her. She is even trying her hand at writing a fantasy/mystery book of her own. James Patterson – 'but not crime' - ranked number one in Wisdom’s picks as well. He enjoys funny books, rounding out this summer’s reading with Jeff Kinney, Morris Gleitzman, Dave Pilkey, Peter Millett and Geronimo Stilton. While both siblings can read a book in a day, they do make time for other activities. They play tennis and enjoy music. They are top students and are both heading to new schools this year – Joshlyn to Mt Roskill Grammar School and Wisdom to Mt Roskill Intermediate. Asked if they have suggestions for making next year’s programme even better, Joshlyn says, “From my perspective, it was a good challenge and a good opportunity, and I’d love to recommend it to other people”. 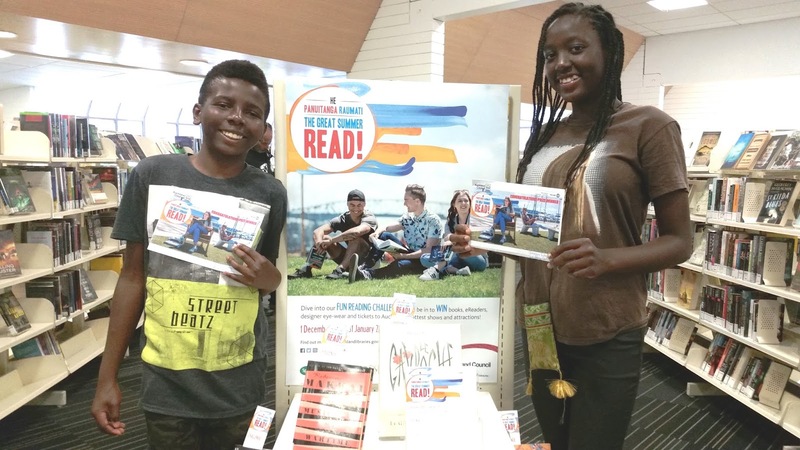 With good-will ambassadors like Joshlyn and Wisdom, we’re sure even more Aucklanders of all ages will be joining the Great Summer Read He Pānuitanga Raumati next year. In the meantime, congratulations and ka pai to these two winners, to the many other 2018-19 prize winners (over 150 of them), and to everyone who joined the Great Summer Read, because as Joshlyn and Wisdom would be the first to say, reading is already a win in itself!